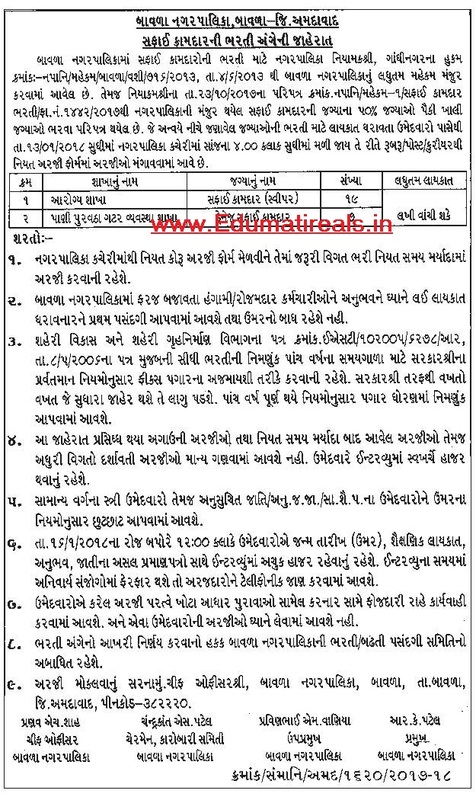 Bavla Nagarpalika Recruitment 2018 : Bavla Nagarpalika has released notification of recruitment for below mentioned various posts. This is a great chance for interested candidates who are looking for Bavla Nagarpalika Jobs 2018.The candidates can apply for the desired post in the prescribed format on or before 13-01-2018. Candidate is advised to visit Official notification before applying for this post. To know further details such as pay scale, age as on, procedure to apply and other information carefully read the notice given below. How to Apply Bavla Nagarpalika Vacancy ? Interested and Eligible candidates may send their application & necessary documents to given address in the advertisement. 0 Response to "Bavla Nagarpalika Recruitment 2018"